South Korean golfer Jin Jeong birdied three of the six holes he played Friday to conclude his first round for a 7-under 65 and a one-stroke lead at the weather-delayed Australian PGA. Home town players Thomas Aiken and Justin Walters moved into a tie for the lead at 17 under at the Joburg Open on Saturday as overnight pace-setters Edoardo Molinari and David Horsey lost ground. Peter Hedblom shot a 3-under 69 Friday to take a two-stroke lead after two rounds of the Perth International. Former top-ranked amateur Jin Jeong won the Perth International on Sunday for his first professional victory, beating England's Ross Fisher with a par on the first hole of a playoff. 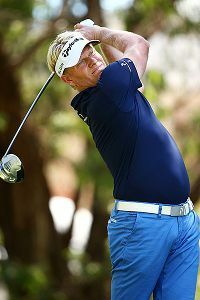 Needing a win to retain his European Tour card, Peter Hedblom started in cool, calm fashion Thursday by shooting a 4-under 68 for a share of the lead with Jin Jeong of South Korea and two Australians after the first round of the Perth International. Australians Scott Strange and Wade Ormsby shared the second-round lead at the Australian PGA on Friday, with defending champion Adam Scott two strokes behind and American Boo Weekley three off the lead.